This source supports updates by default, but each instance may be configured to be read-only or updateable. The initial automatic schema generation setting is ""validate" ", unless otherwise specified. The initial name of the default workspace is ""default" ", unless otherwise specified. The default UUID that is used for root nodes in a store. This source does not output executed SQL by default, but this can be overridden by calling setShowSql(boolean). This source does support creating workspaces. This source supports creating references. 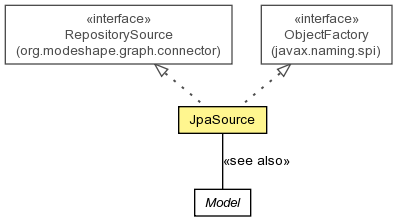 Set up the JPA configuration using Hibernate, except for the entity classes (which will already be configured when this method is called) and the data source or connection information (which will be set after this method returns). Get the Hibernate setting dictating what it does with the database schema upon first connection. Get the time in milliseconds that content returned from this source may used while in the cache. Returns the current EntityManagers reference. Get the model that will be used. Gets the names of the workspaces that are available when this source is created. Returns the current repository context for the source, as set with a call to initialize(RepositoryContext). Get whether this source allows workspaces to be created dynamically. Set whether this source allows updates. Sets the Hibernate setting dictating what it does with the database schema upon first connection. Set the time in milliseconds that content returned from this source may used while in the cache. Set whether this source allows workspaces to be created dynamically. Set the name of the workspace that should be used when clients don't specify a workspace. Set the model that should be used for this store. Sets the names of the workspaces that are available when this source is created. true if this source allows updates, or false if this source only supports reading content. allowsUpdates - true if this source allows updating content, or false if this source only allows reading content. Get the Hibernate setting dictating what it does with the database schema upon first connection. For more information, see setAutoGenerateSchema(String). "create" - Create the database schema objects when the EntityManagerFactory is created (actually when Hibernate's SessionFactory is created by the entity manager factory). If a file named "import.sql" exists in the root of the class path (e.g., '/import.sql') Hibernate will read and execute the SQL statements in this file after it has created the database objects. Note that Hibernate first delete all tables, constraints, or any other database object that is going to be created in the process of building the schema. "create-drop" - Same as "create", except that the schema will be dropped after the EntityManagerFactory is closed. "update" - Attempt to update the database structure to the current mapping (but does not read and invoke the SQL statements from "import.sql"). Use with caution. "validate" - Validates the existing schema with the current entities configuration, but does not make any changes to the schema (and does not read and invoke the SQL statements from "import.sql"). This is often the proper setting to use in production, and thus this is the default value. rootNodeUuid - Sets rootNodeUuid to the specified value. dialect - Sets dialect to the specified value. dataSourceJndiName - Sets dataSourceJndiName to the specified value. driverClassName - Sets driverClassName to the specified value. driverClassloaderName - Sets driverClassloaderName to the specified value. username - Sets username to the specified value. password - Sets password to the specified value. url - Sets url to the specified value. maximumConnectionsInPool - Sets maximumConnectionsInPool to the specified value. minimumConnectionsInPool - Sets minimumConnectionsInPool to the specified value. maximumConnectionIdleTimeInSeconds - Sets maximumConnectionIdleTimeInSeconds to the specified value. maximumSizeOfStatementCache - Sets maximumSizeOfStatementCache to the specified value. numberOfConnectionsToAcquireAsNeeded - Sets numberOfConnectionsToAcquireAsNeeded to the specified value. idleTimeInSecondsBeforeTestingConnections - Sets idleTimeInSecondsBeforeTestingConnections to the specified value. Get the model that will be used. This may be null if not yet connected, but after connections will reflect the type of model that is being used in the store. Set the model that should be used for this store. If the store already has a model, specifying a different value has no effect, since the store's model will not be changed. After connection, this value will reflect the actual store value. largeValueSizeInBytes - Sets largeValueSizeInBytes to the specified value. compressData - Sets compressData to the specified value. referentialIntegrityEnforced - Sets referentialIntegrityEnforced to the specified value. Set up the JPA configuration using Hibernate, except for the entity classes (which will already be configured when this method is called) and the data source or connection information (which will be set after this method returns). Subclasses may override this method to customize the configuration. This method sets up the C3P0 connection pooling, the cache provider, and some DDL options.